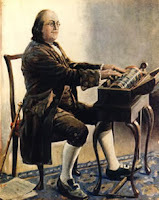 One of the most unusual instruments Beethoven ever wrote for (and that's saying something considering he wrote for Panharmonicon, cannons and ring-tone) is the "glass armonica". This is an instrument which is made up of spinning bowls upon which the performer "lays hands on". The spinning bowls remain wet from a water pool, so that when the player places his/her hands on it, the vibrations create a somewhat ethereal tone. It's the original version of the "wine-glass" music that is much more prevalent today on late night TV. The glass armonica was invented by Benjamin Franklin and was thought to cause insanity for it's player. Actually the performer got lead poisoning from touching the spinning (unrefined) glass. Beethoven only wrote about a minute and a half of music for the glass armonica in the incidental music for Leonore Prohaska, WoO.96 (1815). I entwined for you, Two flowers: one for love, and one for constancy. Alas! All I have for you now are death's flowers! And yet, from the earth on my tomb The lily and the rose bloom anew. Here's a video of the glass armonica Melodram piece B. wrote (with some additional variations composed by Charlie Barber) performed by Alasdair Malloy.